A total of Three Hundred and Seventy-five (375) prizes will be awarded during the Promotion. The Approximate Retail Value (“ARV”) of all Grand Prizes is $35,000.00. The ARV all Runner-Up Prizes is $3,500.00. The ARV all Instant Win Prizes is $5,000.00. The ARV of all prizes is $43,500.00. The Catch the Ballard Bug Sweepstakes is open only to legal residents of the 48 United States and the District of Columbia, (excluding Alaska and Hawaii) who are 18 (except Alabama and Nebraska 19 and 21 Mississippi) years of age or older. 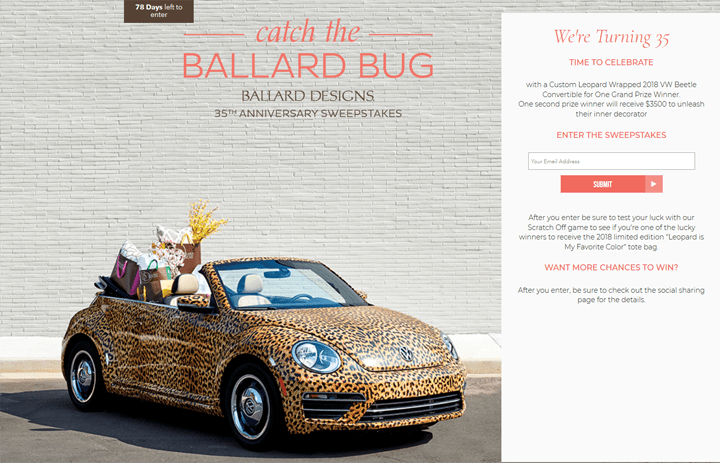 The Catch the Ballard Bug Sweepstakes ends at 11:59:59 PM ET on November 15. To participate, go to ballarddesigns.com/CatchIt to gain access to a registration form, if you haven’t done so previously. Complete the registration form with your true and correct information in the required fields. Limit of up to Eighty-One (81) Sweepstakes Entries per person. THE DESIGNED WRAP FOR THE VW SHOWN IS BEAUTIFUL. I would be happy to drive around in this Bug Convertable. I would be happy to drive around in this Bug Convertible. I would get a lot of complements driving this car. THE LEOPARD BEETLE WOULD BE MY GRANDAUGHTER’S DREAM CAR.